Avatar Mice: a Revolution against Cancer? This is how New Zealand physicist Ernest Rutherford and his colleague Englishman Frederick Soddy reacted to the surprising result of a series of careful experiments conducted in 1901 at McGill University in Montreal (Canada). They had long sought to understand the phenomenon of radioactivity, discovered by Becquerel and described by Marie and Pierre Curie. And they had eventually succeeded in demonstrating that the atoms in radioactive materials disintegrate, so that the atoms of a radioactive element are transformed into another element. Transmutation, which had been sought for so many centuries by alchemists, happened spontaneously and naturally. The idea was so groundbreaking that Rutherford and Soddy tried to avoid prejudices and spoke of transformation instead of transmutation when they published “The cause and nature of radioactivity” in 1902, which summarized their experiments resulting in the theory of atomic disintegration. Its publication broke the scientific dogma that the atom was indivisible (which is what atom means in Greek). 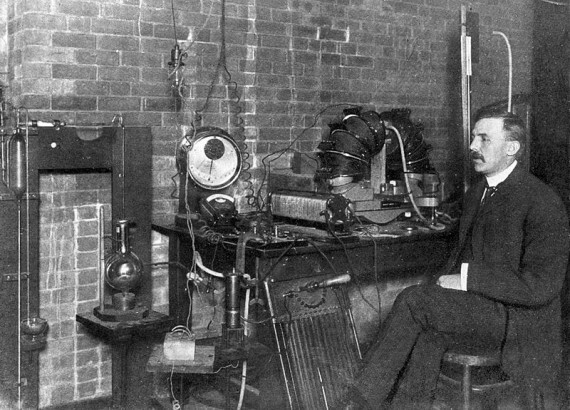 Ernest Rutherford (1871-1937) identified the three main types of radioactivity: alpha rays, beta rays and gamma rays, and he continued to study transmutation. He saw what appeared to be stable lead atoms in the middle of a radioactive uranium ore. There was no way to know when a particular atom was going to transform, but Rutherford noticed that any sample (large or small) of the same radioactive element required exactly the same time to be reduced by half. This amount of time, called half-life, turned the radioactive elements into perfect chronometers. Knowing this constant speed at which uranium is transformed into lead and measuring the amount of lead that there was in a pitchblende rock (uranium ore), Rutherford and his colleague Boltwood calculated in 1907 that some of the stones were at least one billion years old. This was much older than the Earth was thought to be! Rutherford used radioactivity to explore the interior of atoms. Together with his student Geiger, he shot alpha rays against a thin gold foil and watched in astonishment as some of these alpha particles bounced back. Recovering from the impact, in 1911 he concluded that this was only possible if the atoms had a tiny nucleus, positively charged, in which was concentrated almost all its mass. Rutherford’s atomic model had been born, later perfected by his student Bohr: that familiar image of the atom, with the electrons orbiting the nucleus. In his laboratory, Rutherford continued bombarding atoms with alpha rays, until in 1919 he succeeded in transforming nitrogen atoms into oxygen, thus becoming “the first successful alchemist in history.” That transmutation of nitrogen into oxygen was the first artificial nuclear reaction, and among its remains Rutherford found the proton, a new subatomic particle with a positive charge. 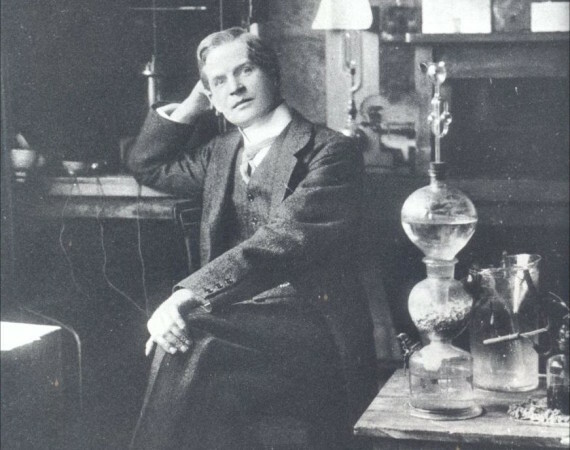 Meanwhile, Frederick Soddy (1877-1956) had continued to explore the natural decay of radioactive elements, and discovered in 1913, at the same time as Kazimierz Fajans, the rules of transmutation: when an atom emits an alpha particle, it spontaneously moves back two places in the periodic table (e.g. uranium-238 is transformed into thorium); when an atom emits a beta particle, it moves ahead one place (e.g. carbon-14 becomes nitrogen). Following these rules, known as the Fajans-Soddy law, chains of natural decay are produced, such as those that begin with the radioactive uranium-238 and finish at stable lead, passing through intermediate products such as radium or uranium-234. By studying these chains step by step, Soddy discovered isotopes along the way. They are distinct versions of the same element, with atoms of different weights but containing the same chemical properties. The 1921 Nobel Prize in Chemistry acknowledged the findings of Soddy, which had inspired the author H.G. Wells to write his science fiction novel “The World Set Free” (1914). This book, which Wells dedicated to Soddy, anticipated the danger of nuclear weapons, almost 20 years before Leo Szilard conceived the idea of ​​a chain reaction. Soddy was very concerned about the use that was being made of scientific discoveries, which led him to write in 1926 a radical critique of the Western economy, analyzing it by means of the physical laws of thermodynamics. According to Soddy, the system confuses wealth with debt, and he was also among he first to criticize economic growth based on the use of fossil fuels for energy production. His proposals for reforming the monetary system, which are now common practice, were at that time neglected and ignored because they were considered eccentric… as if Soddy pretended to be an economic alchemist in search of a philosopher’s stone to transform debt into wealth.